"I believe in Catherine McAuley High School. 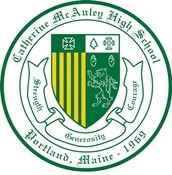 I love Catherine McAuley High School." Sister Edward Mary Kelleher, Principal Emerita, and Candy Anderson-Ek, Director of Admission, believe in Catherine McAuley High School. They believe in the School's mission and in the potential of each girl educated in the rich spirit of Mercy. They believe that McAuley's mission today is as relevant now as when it was founded in 1969. In addition to their daily service, they give to the Annual Fund and invite you to join them. Your donation directly impacts our students. Annual Fund gifts provide inspiring teachers, scholarship assistance, cutting-edge technology and upgraded equipment, as well as varied athletic and co-curricular opportunities for our girls. This is a crucial time for Catherine McAuley High School, for all-girl education in Maine and for values-based education. If you also believe in the value of McAuley and in the power of girls, please make your Annual Fund gift today. Give Back to Give Forward. Donate Here.